I now receive targeted coupons from King Soopers, the local grocery store. Obviously by shoppers using their Sooper Cards, they (those people in an office somewhere who run reports) know exactly what products their customers buy on a regular basis. I am not bothered by this. I love to eat Clif bars for breakfast, so if they want to send me coupons, bring it on. In the most recent coupon mailing, the good people at KS also included recipes. Today the weather in Denver made a dramatic shift. Last weekend it was in the 80s and sunny. All week it was nice, but getting a little windier during the day and a little cooler at night. But even last night I was able to sit out on the patio without freezing to death. But then it happened. It usually happens within the first two weeks of October. The first snow of the season. It doesn't stick, but it does remind us that winter is on the way. Among my friends this is usually a cause for celebration because it means that ski and snowboard season is right around the corner. And what goes better with snow than chili? First, dig your crock pot out from the back of your kitchen cabinet. In a fry pan on the stove heat up the oil and then saute the onion and garlic until tender. Your kitchen will smell delicious. Stir in the turkey and cook until evenly browned. Drain the fat. Put turkey and onions into the crock pot. Add the tomatoes, pumpkin, beans, and seasonings. Stir until mixed. Put your crock pot on low and walk away. 4-5 hours later your chili is ready to enjoy. Garnish with sour cream, cheese and pumpkin seeds. 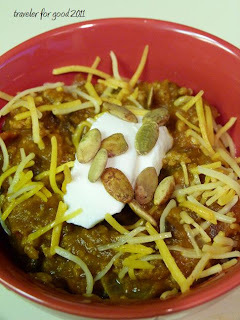 You cannot taste the pumpkin, but it adds almost a creamy texture to the chili. And since the ski season is just around the corner, here's the "shoe" picture for this post in honor of the Flippin' Good Deeds Challenge. 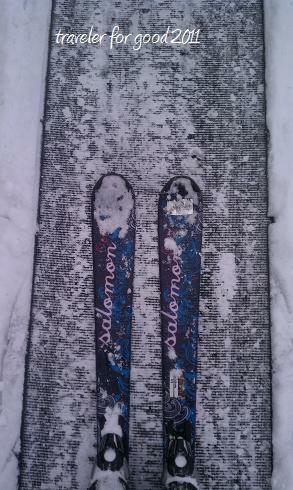 My skis on the moving walkway at Beaver Creek last season. To learn more about Soles 4 Souls, click here.